ISBN 1495088626. 9x12 inches. 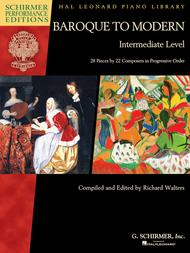 Compiled & edited by Richard Walters. ANTHEIL: Little Shimmy C.P.E. BACH: Solfeggietto in C minor, H. 220 J. S. BACH: Prelude in D minor, BWV 926 • Prelude in C minor, BWV 999 BARBER: Petite Berceuse • To My Steinway from Three Sketches for Piano BEACH: Gavotte in D minor from Children's Album, Op. 36, No. 2 BEETHOVEN: German Dance in C Major, WoO 8, No. 7 BONIS: Frère Jacques from Scènes enfantines, Op. 92, No. 6 BURGMÜLLER: Restlessness (Inquiétude) from 25 Easy and Progressive Studies, Op. 100, No. 18 CHOPIN: Prelude in A Major, Op. 28, No. 7 CRESTON: Rustic Dance from Five Little Dances, Op. 24, No. 1 HANDEL: Prelude in G Major from Suites de pièces, Volume 2, HWV 442, No. 9 HELLER: Study in A minor (“The Avalanche”) from 25 Melodious Etudes, Op. 45, No. 2 KABALEVSKY: Lyric Piece from 30 Pieces for Children, Op. 27, No. 16 • The Chase from 30 Pieces for Children, Op. 27, No. 21 • Rondo-Toccata from Four Rondos, Op. 60, No. 4 KHACHATURIAN: Ivan Sings from Adventures of Ivan MACDOWELL: To a Wild Rose from Woodland Sketches, Op. 51, No. 1 MOZART: Funeral March for Signor Maestro Contrapunto, K. 453a • Adagio for Glass Harmonica, K. 356 (617a) MUCZYNSKI: Fable No. 9 from Fables, Op. 21, No. 9 PROKOFIEV: Morning from Music for Children, Op. 65, No. 1 • Promenade from Music for Children, Op. 65, No. 2 RAVEL: Prélude D. SCARLATTI: Sonata in D minor, L. 423 (K. 32, P. 14) SCHUMANN: Of Strange Lands and People (Von fremden Ländern und Menschen) from Scenes from Childhood (Kinderszenen), Op. 15, No. 1 SHOSTAKOVICH: Birthday from Children's Notebook for Piano, Op. 69, No. 7.